Confusion matrix created from the code below. Perfect results would be black along the diagonal. 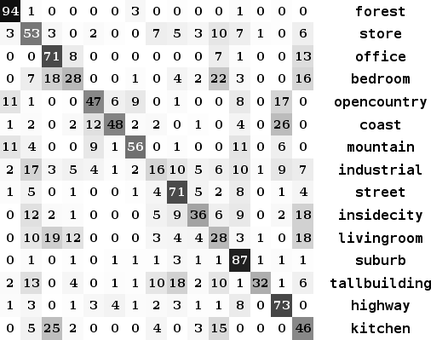 Scene classification is the problem where you are presented with an image and you need to classify it as belonging to a known set. The example below demonstrates how to perform scene classification using dense SURF features and a nearest neighbour classifier. See code documentation for a more detailed discussion. * Process all the data in the training data set to learn the classifications. See code for details. * Extract dense features across the training set. Then clusters are found within those features. * contains the word histogram and the scene that the histogram belongs to. // against the overall number of features changing. // Not the best coloration scheme...  perfect = red diagonal and blue elsewhere. // SURF results are interesting. "Stable" is significantly better than "fast"! // couple of pixels at scale of 1. Thus there is less overlap between the features. This page was last edited on 16 October 2018, at 19:58.